SKU: Hitch Pin. Categories: Shop All ThinLine Products, Horse And Rider Tack. Tags: arena drag pin, tractor pin, trailer pin. 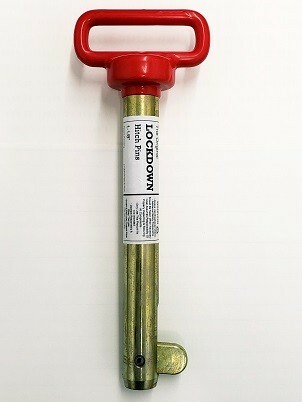 This newly patented Locking Hitch pin provides you with an easy way to hook up those manure spreaders and arena drags. Self Locking vertical hitch pin replaces the need for cotter and lynch pins to secure connection. 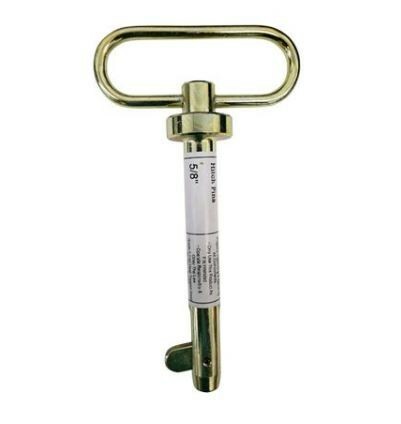 The lock is gravity actuated and does not require greasing. Years of rigorous testing in the field and on the road by working farmers. 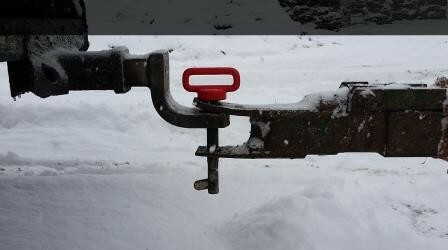 Use this hitch pin on field implements, tractors, wagons, trailers and more in all weather conditions. Our pins meet or exceed the strength and durability of comparable pins on the market in addition to providing a more secure way to use them. The pins and latches are made from heat treated grade 5, C40 steel that has been gold oxide plated. All machined parts have been cut with a chamfered edge to minimize any possible distortion of a corner when struck by an outside force. The coiled spring pins that are used as the pivot point are made from high strength, hardened stainless steel. 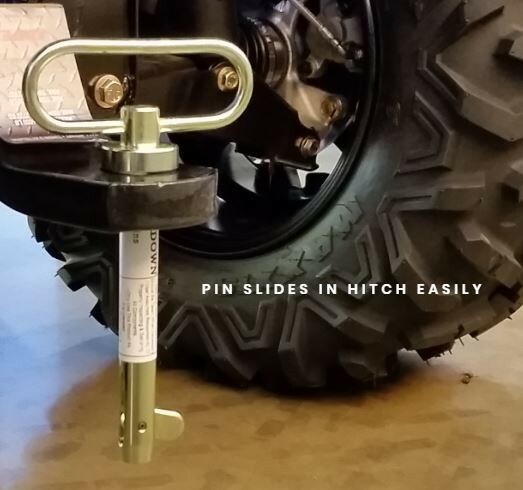 Lockdown hitch pins are self-locking, vertical hitch pins used to connect any tractor or truck to field implements, wagons, trailers, spreaders, mixers and other tow-behind applications. The locking mechanism is gravity actuated and held in place by its own design. Its purpose is to replace the need for cotter or similar accessory pins that must be inserted into the bottom hole of the hitch pin. These are often lost out in the field due to impact with the ground and rocks. Corn stalks and windrows of hay snag, push and pull these pins out of place. The inventor is a fifth-generation dairy and crop farmer. his family, along with other members of the Ag and construction industry, have thoroughly tested these pins in every possible application. Meets or exceed the strength and durability of comparable pins on the market. Utilizes a much heavier handle and head that is PVC coated for extended life. Made from heat treated grade 5, C40 steel that has been gold oxide plated. Cut with a chambered edge to minimize any possible distortion of a corner when struck by an outside force. Coiled spring pins that are used as the pivot point are made from high strength, hardened stainless steel. Sizes currently come in diameters of .75″, .875″, and 1.125’’. 5/8 x 5″ Lawn mower or ATV with small drags, dump carts, rollers. 3/4 x 7 Great for hay wagons, small spreaders, drags, rollers, hay rakes and small bailers. 7/8 x 7″ most medium sized spreaders, field implements, larger hay wagons, rakes and tedders, bailers. 1.0 x 8″ Most mid to large sized farm implements of any kind; tank spreaders, manure spreaders, fertilizer spreaders, large bailers. 1 1/8 x 9″ Larger scale equipment.